For glamorous people with dirty nails… Who wants to cut the red roses in ugly gloves? Where are all the dazzling rakes hiding? And why is no one wearing sequined rubber boots when it is pouring rain? Garden Glory wants the outdoor life to be more beautiful, elegant and merry. That is why the brand decided to be the first company in the world to design colourful garden hoses, followed by nozzles and wall mounted hose holders. The Garden Glory hoses inspire a dance through the pansies and getting out to nourish precious flowers and zesty leaves. They can be placed on any walls and you can mix, match and have fun with the designs. Every season Garden Glory introduces new colours and designed products. 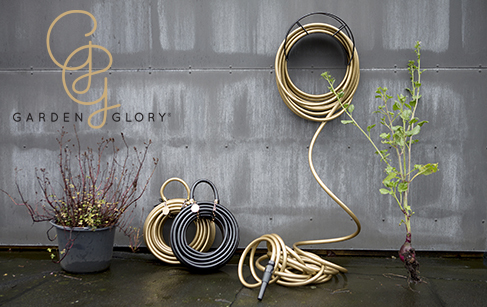 All Garden Glory hoses are manufactured in Scandinavia from carefully selected materials of the highest quality. This means that the tube has tricot reinforcement around the inner tube, instead of the cheaper cross-reinforcement. This makes the hose pliable and flexible and prevents kinking. Kinking is a common and irritating problem when you drag your hose around the garden. The outer plastic has a dirt resistant surface and is UV-protected so that the hose will stay looking great year after year. The hose length is 20 meters and all hoses, nozzles and wall mounts can be combined to match or compliment you, your house and your garden.